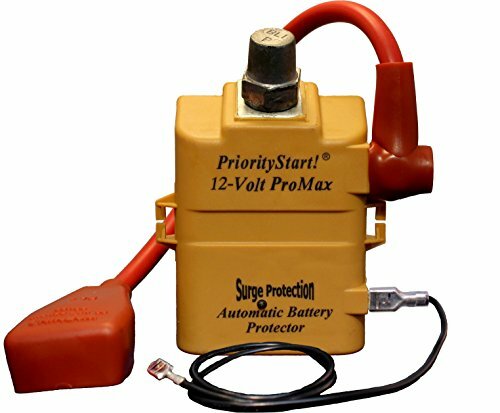 PriorityStart Is a totally automatic heavy duty electro-mechanical computerized on/off switching device. Designed to protect a battery, keeping it from going dead, preventing damage to battery, alternator, and electrical system, at the same time providing peace of mind, and safety, while saving you time and money. If battery voltage drops below 11.7 volts (when engine is off), it AUTOMATICALLY disconnects the load, battery voltage immediately recovers, and No dead battery. AUTOMATICALLY reconnects with small load change (0.2Mv) I.E. OPERATE HEADLIGHT SWITCH, STEP ON BRAKE PEDAL, POWER SEAT, ETC. No raising the hood (potentially dangerous), No remote to carry, No buttons to push. Totally automatic and pays for itself the first time used. A dead battery costs you time and money, first time a battery goes dead you have damaged more than half the battery life. Protect your family, your wallet, and your time with PriorityStart. If you have any questions about this product by PriorityStart, contact us by completing and submitting the form below. If you are looking for a specif part number, please include it with your message.